You need coffee to wake up in the morning. You really need coffee when it's cold. You really, really need coffee when it's cold in the morning and you're camping. 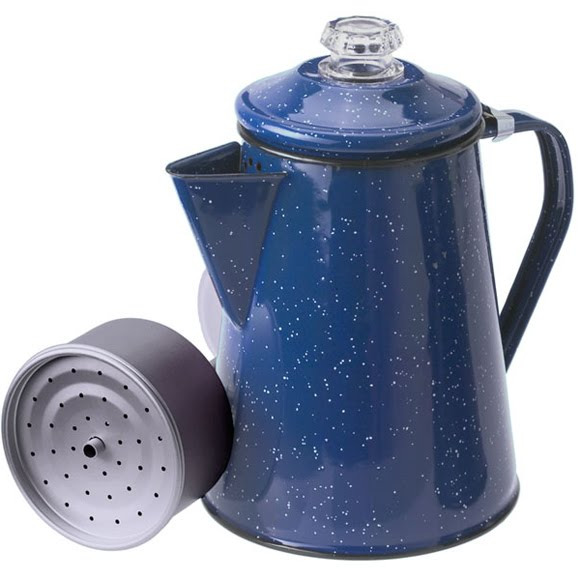 GSI Outdoors provides a quality coffee percolator so you can brew what you need to function early on those campin' mornings. You need coffee to wake up in the morning. You really need coffee when it&apos;s cold. You really, really need coffee when it&apos;s cold in the morning and you&apos;re camping. GSI Outdoors provides a quality coffee percolator so you can brew what you need to function early on those campin&apos; mornings. Inspired by traditional Graniteware, our Enamelware blends old-fashioned charm and functionality into one sturdy package. Built from heavy-gauge steel with a classic speckled enamel finish, every piece has been kiln-hardened twice at 1400 degrees F to stand up to scratches and chipping. Plus, three-ply construction maximizes heat distribution for even cooking. Dimensions (packed) 8" x 5.9" x 9"